July 14, 2012 marked the 100th anniversary of Woody Guthrie’s birthday and just a few days before that Smithsonian Folkways released ”Little Seed: Songs for Children by Woody Guthrie” by Elizabeth Mitchell, the only CD of Guthrie’s children’s songs coinciding with the Woody Guthrie Centennial. This is Mitchell’s third release from the Smithsonian Folkways label and her sixth children’s album to date. “Little Seed” is a mix of 8 previously released tracks and 5 newly-recorded tracks by Mitchell which sound great laid out on one album together. The songs covered on “Little Seed” stem from two of Woody Guthrie’s children’s albums, recorded in 1947, called “Songs to Grow on for Mother and Child” and “Nursery Days.” Like Guthrie, Mitchell is a folk frontrunner and icon in her own right, being the first female artist signed to the Smithsonian Folkways label and certainly one of the most beloved artists within the kid’s music scene. 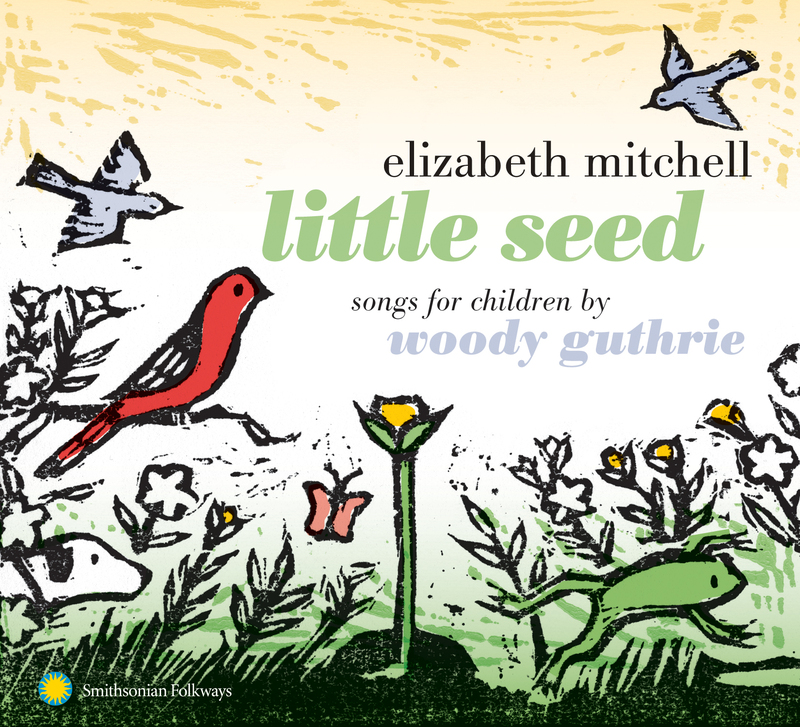 So it is with little surprise that Elizabeth Mitchell released a children’s album in celebration of Woody Guthrie’s life. And, while all of her music in the last 10+ years has been directed towards children and families, her sound is highly portable and could very well crossover into the adult arena without a snicker or sneer. In comparison to the otherwise dusty recordings of the Guthrie originals, Mitchell brings color and life to her re-imagined versions on “Little Seed.” Not to mention she very easily glides through some complex tongue-twisting lyrics, which happen to remind me of a few Dr. Seuss books, making it even easier to follow along than some of the originals. Mitchell’s voice is soothing and clear like a serene lake and refreshing like a cold glass of water on a hot day. “Little Seed” contains regularly covered classics like “Riding In My Car” which features Mitchell’s niece’s sweet little voice singing along and laughing about a frog riding in a car, and “Bling Blang” which is brought to life by the upbeat rhythm of some chest thumps and knee slaps. There is also an ode to the wonderment with which a child experiences while riding on a carousel in “Merry Go Round” which personifies the experience of riding a pony and reels us into the innocence and wonder of a child’s imagination. The lyrics so sweetly and vividly bring the pony to life as Mitchell sings /come lets rub the ponies hair…/now let’s climb on the ponies back…/pick up my reins and buckle my straps…/it’s faster now my pony runs/up to the mooon and down to the sun/my pony runs to the music and drums/around and around and around/now he runs as fast as the wind and gallops and trots and dances a jig/ my pony is tired and wants to slow down/around and around and around. Mitchell is not alone in the arrangement and production of this album. As in previous albums, her daughter Storey and her husband Daniel Littleton join in with additional vocals and instrumentation. I particularly like the dimension Littleton’s voice adds on “Why Oh Why” and his guitar solo on “Who’s My Pretty Baby,” which happens to be a beloved Elizabeth Mitchell classic in our home. Additional artists like Dean Jones from Dog On Fleas, as well as Clem Waldmann, a recognized percussionist from Blue Man Group and his wife Kristen Jacobsen also join in broadening the depth of the sound, further bringing Guthrie’s songs to life. The addition of the the balafon, played by Dean Jones, and the flute played by Clem’s wife Kristen Jacobsen in “Sleep Eye,” one of my favorites on this album, brings a playful element to the song. Also notable is Clem Waldmann’s percussive accompaniment on “Rattle my Rattle” which is funky and adds more space to the updated version; whereas Guthrie’s version feels slightly more rushed in order to keep up with the complexity of his own words and much like a baby shaking a rattle. “Little Seed” was a sentimental project for Mitchell as the discovery of Guthrie’s children’s album “Songs to Grow On for Mother and Child” is what inspired her to start making music for children. She has done an excellent job of capturing Woody’s sweet, loving and sensitive side in her celebration of his life. The album is 29 minutes long, available for purchase or download through Amazon and is packaged with 20 pages of liner notes containing snippets of lyrics and beautiful photos of Mitchell and her family; it’s a beautiful keepsake for already devoted fans, as well as, newcomers. The booklet also contains a bit of historical fact and references for literary works that have been published on Woody, as well as the song “This Land Is Your Land.” Mitchell not only includes this song on the album, even though it was not intended to be a children’s song when Woody first wrote it, but makes a point of singing three verses that are often left out in more recent versions of the song. Should you wish to download the album and liner notes, you can find them at the Smithsonian Folkways website, which also offers the option to buy the CD. Either way, it’s an excellent sampler which will invite your family into the beautiful world Mitchell creates through her music. These are classic little ballads that should be passed down (and most likely will be) through generations, as Woody’s songs have thus far. Recommended for ages 0 – 5, however, older ones will most likely enjoy trying to keep up with Mitchell as she sings some of the quick repetitive verses. Below is a video released a while ago created for an HBO animated family series.